Perfect recipes for the ultimate romantic night in this Valentine's day and also as Spring I promise you is round the corner. There are a few recipes rom Debbie and Andrew's sausages that you could try. I decided to give the "Give A Fig Salad Recipe " a whirl. It was very quick and easy to do and ready in no time at all. 1. Preheat your oven to 180°C. Place onions in a roasting dish and lather in salt, pepper and olive oil. Bake for 20 minutes until soft and golden. 2. Chop the debbie&andrew’s Perfect Cumberland Sausages into thick slices on the diagonal and in a non stick large fry pan, fry off over a medium/high heat until lovely and golden. Set aside. 3. 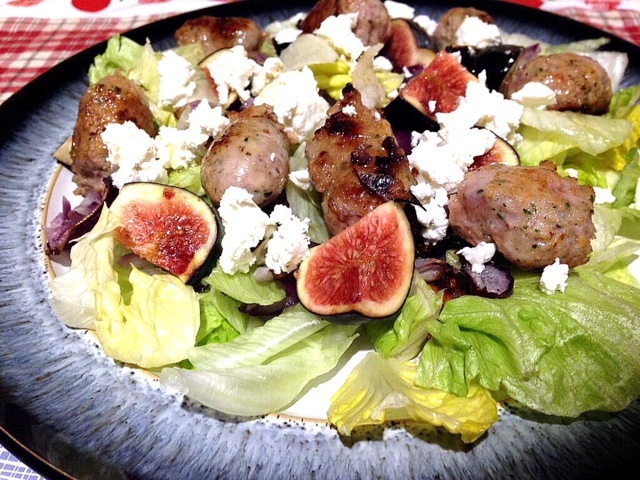 Assemble your salad by layering salad leaves, red onion, sausages and figs. Season with salt and pepper. Finish with a generous drizzle of olive oil, balsamic glaze and crumbled feta. 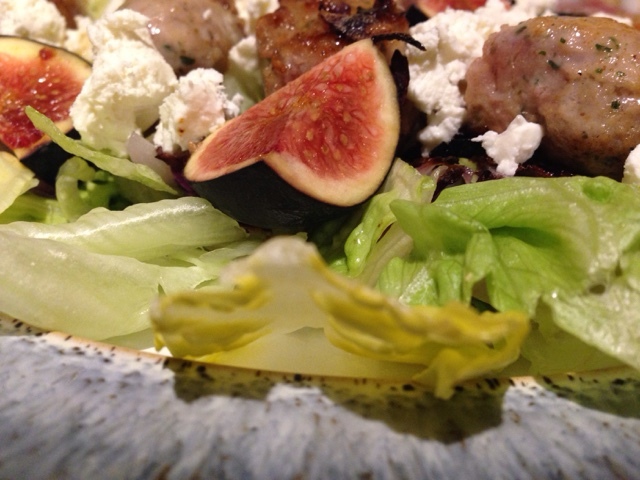 And the sweetness of the figs balance beautifully the saltiness of the feta . 2. In a large heavy based saucepan over a medium high heat, fry off the leeks, sausages and apples in the olive oil and butter for about 10 minutes until golden brown. Stir in the flour and cook out for a further 2 minutes. 3. Add the cider and reduce down to half. Add the stock, mustard and double cream and reduce until lovely and thick. Cool. 5. On a floured bench top, cut out 6 pieces of pastry just larger than the small pie dishes/cups. Lay over the top of the pie dishes, using a fork tightly press the edges. 6. Brush the pastry with the beaten egg and sprinkle with pumpkin seeds. 7. Bake for 20-25 minutes until lovely and golden. Serve hot! This post is in collaboration with Debbie and Andrew's Sausages ~ The recipes are theirs. The bottom photo of the pie is there but the pictures of the Give A Fig Salad are mine. I love figs, would never have thought about putting them with sausages but it does sound yummy. Ooh I love figs. Sausages and figs aren't a combination I would have normally put together but this looks delicious. We love sausages but I only tend to do them on their own with mash or in a casserole. I love the two recipe ideas here, especially the fig on. Pinning for future reference. 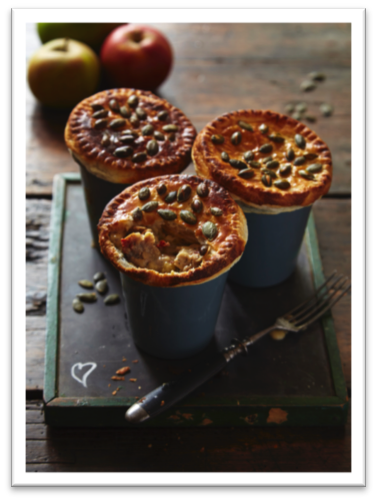 The pies look lovely perfect for picnics and lunch boxes. An unusual combo - I wouldn't have thought of that.